Ear piercing has been among the most common and oldest forms of body modifications. Selecting the right ear piercing jewels is of utmost importance. This is not a simple task if you’re not shopping from an authentic dealer that has enough expertise in this realm. To help you out, here is Piercebody.com. Piercebody.com is among the largest online stores to be browsed for a wide range of ear piercings. Here you can find a good selection of wholesale piercing jewelry that includes earplugs, earrings, and studs. Even if you are among those who fear from the puncturing of ears or painful stretching, you can simply exercise your choice for Organic ear plugs at Piercebody.com. Organic earplugs are generally made to make you look stylish and comfortable at the same time. These earplugs are made of either high-quality hardwood or UV material in compliance with the highest standards of skin-friendliness. These earplugs are always unique pieces of art. They are designed with full attention to detail. Organic Earplugs may come in a variety of shapes and sizes. They are available as saddle-shaped, cylinder-shaped, one-flared, nail-shaped, taper-shaped, and spike-shaped. These organic body jewelry wholesale earplugs are also available as pre-oiled to ensure smooth insertion between your earlobes. Since they are pre-textured, these earplugs will remain in the same shape for a long while. 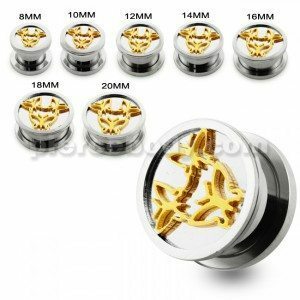 In our inventory, you can also find fake earplugs, anodized earplugs, pyrex glass ear piercing, surgical steel ear piercings, silver ear piercings, and silicone ear piercings to complement your unique style.